Located in the beautiful Santa Ynez Valley, this charming little historic town is a rewarding and relaxing weekend getaway or fun-filled day. 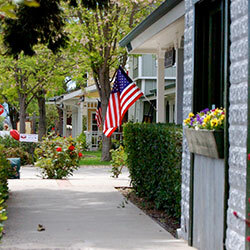 Boasting expansive views of Santa Barbara County’s vineyards and horse ranches, Los Olivos is noted for its love of the arts, wine tasting opportunities, unique shopping, epicurean restaurants, fun events, antiques, nearby recreational landscapes, and friendly residents found throughout the village. Signature events include the "Jazz and Olive Festival" the beginning of June; the "Annual St. Mark's Cellar Classic" at the end of June; "Bacon and Barrels" in July; the "Los Olivos Quick Draw and Arts Festival" in August; "Day in the Country" in October; and an "Olde Fashioned Christmas" in December. Foxen Canyon Wine Trail starts in Los Olivos and stretches north, winding its way through beautiful wineries and vineyards. Access spring wildflowers or hiking trails by traveling up Figueroa Mtn. Rd directly across Hwy 154 from Los Olivos. AAA’s Westways - "Day Trip, Los Olivos"
Modern Luxury Orange County: "Trail Guide"
Join us in Los Olivos as we celebrate the start of summer at our town Block Party! Come get some "Locals Love" with specials all over town, created just for this day. We're even planning a mini bocce tournament at our local tasting rooms here in town! More details will be posted soon at https://www.facebook.com/events/535731706826856/. Located in the beautiful Santa Ynez Valley, the charming historic town of Los Olivos is a rewarding and relaxing weekend getaway or fun-filled day.